On 19 April the Voce ladies sang with Il Divo and Katherine Jenkins in the last UK concert of the pop-opera supergroup's European tour. Together with a few friends from other leading London choirs, we performed choral backing for the final encore of the concert in London's O2 Arena. Even though, for some of us, it wasn't the first time we'd sung in the O2, we couldn't help but be taken aback by the sheer scale of the venue. As one singer observed, 'there's nothing like an audience of 12,000 to make you learn your notes quickly!' After a quick rehearsal with the show MD and orchestra manager, we were whisked into soundchecks before being smuggled into a special VIP concert and Q&A with the principals - a rare treat. And what a show! 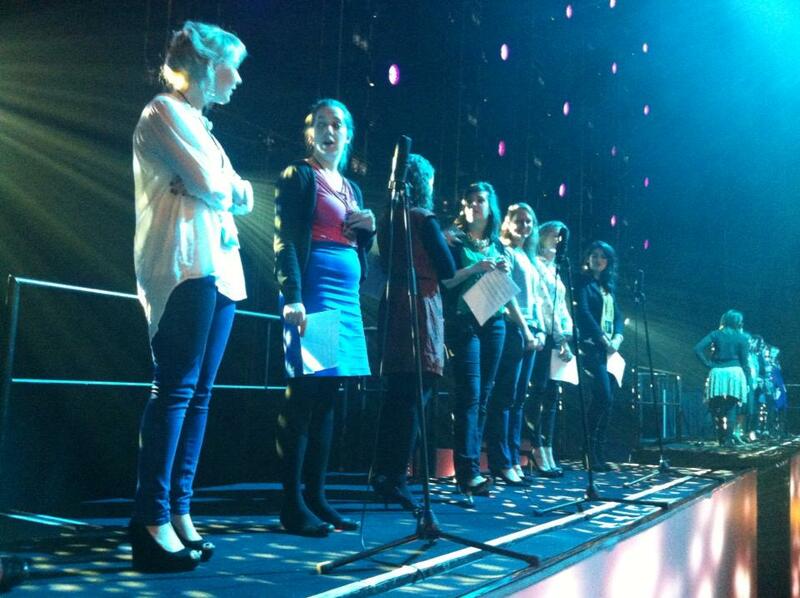 The altos were particularly impressed by Katherine Jenkins' sparkling diamante mic, which we spotted backstage. Luckily we were spared the temptation of stealing it by Ms Jenkins herself, who rescued it en route to the stage for our final number, It's Time To Say Goodbye. It's a big, stirring sing, and the audience were on their feet as the song grew to a triumphant crescendo. Our thanks go to MD Andrew Small, conductor Simon Chalk, and everyone on the Il Divo tour staff for their warm welcome. And of course, we'd like to thank the boys from Il Divo and Katherine Jenkins for asking us along! Were you in the audience at the London O2 for the Il Divo and Katherine Jenkins concert on 19 April? What were your favourite moments? Tweet us @vocechoir, talk to us on Facebook or send us a message.